a prolific writer and a researcher and expert on Iqbal. Inspired by Iqbal, the SoIS strives to remove the despondency among our nation and to develop a positive outlook towards our future. 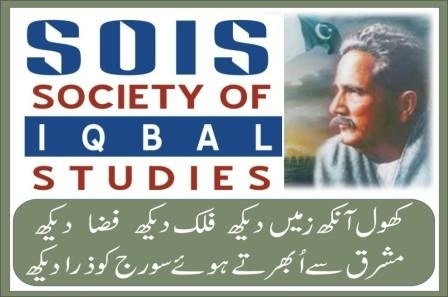 The objective of SoIS is to understand Iqbal, his ideology and his message through his writings and other literary works, and to explore modern history in the light of Consensus Literature that has played a great role in history of mankind. This is a type of literature different from the commonly known types “Popular” and “High”. Society of Iqbal Studies aims to know the concepts and ideas of Iqbal about History, Literature, Politics, Religion and Education and their role in Nation’s collective life, to recognize what is actually “Pakistan”, and to revisit the history of Pakistan from a different perspective. SoIS has been conducting a series of Workshop based on Iqbal’s concept of History, Literature, Politics, Religion and Education for quite some time. For Iqbal the literature should not slavishly imitate the existing realities but should be idealistic. Writers can address the existing issues and their solutions through characters that should become ideals for the readers, so that readers learn to apply the same approach in their lives. Also, writers and poets are responsible to guide the readers towards the positive side of the world, and to describe and show beauty, love, desire and the quest for glory. Literature should have vision and inspiration that could lead the reader towards character development and could unfold the layers of thinking in their mind. Also, the literature of Pakistan since Iqbal is being revisited in the light of the seven stages of Pakistan’s history and the ideals commonly sought by the nation, to see which writers and poets have influenced the masses most during various periods of our history. Currently, the Society is currently conducting a series of revising all works of Iqbal according to their Publication sequence.